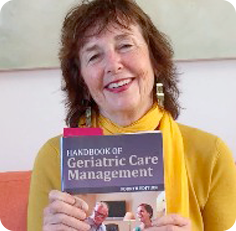 Geriatric Care Managers play a big role in end of life issues. They are their navigators through all five stages of dying, many times long before palliative care or hospice are called. Often GCM’s can help the family and client to bring in hospice or palliative care. The final passage through life can emotionally charged. If the family is following a long labyrinth to the end, the blind alleys may be blocked by cultural, religious, and moral beliefs. GCM ‘s can find an opening through this maze. Money, family dynamics and fear of dying can all explode a fraught crisis of care in dying. When important end of life decisions need to be made, the stress of the responsibility, and the seriousness of the situation can break a wave of distress fear and anxiety over the “ whole family system” the dying elder. The geriatric care manager specializes in this whole family system. Geriatric Care managers are often help facilitate throbbing discussions, and facilitate family members coming together to work as a functional unit. Understanding the differing viewpoints is critical. Knowing what a parent wants and does not want during the last days and hours of life help define and simplify the role of family. It relieves the family of the burden of having the responsibility of making decisions which may not be what their parents want. Turning this around can also avoid family conflicts when adult children may have differing values. Proactive discussions and legal planning building a circle of care can help to reduce some of the potential conflicts. Good legal guidance can also help to pay for care when an adult child wants to finance in home care. But geriatric care managers do much more with clients and families who are facing end of life.